This week I’d like to touch on one of my favourite topics: therapy dogs. These dogs are close to my heart, having started the Community (formerly Chestermere) Therapy Dogs Society (CTDS) back in 2013. There is, understandably, some confusion in people’s minds as to what makes a therapy dog versus, say, a service dog or a companion (or support) dog. One of the characteristics that stands out for me in a therapy dog is their willingness to either be with an individual or be part of a larger group and conduct themselves in a calm, relaxed manner. Service and companion dogs have much more of a one-to-one relationship with their owners. •The kind of temperament that shows they love being around and with people, whilst conducting themselves in such a way that purveys a calm demeanour. •Obedience to a level where the owner has complete control over their dog and, through focus on the owner, the dog recognizes the owner to be the “pack leader”. •No physical issues that could cause a problem when meeting, or being with, people. 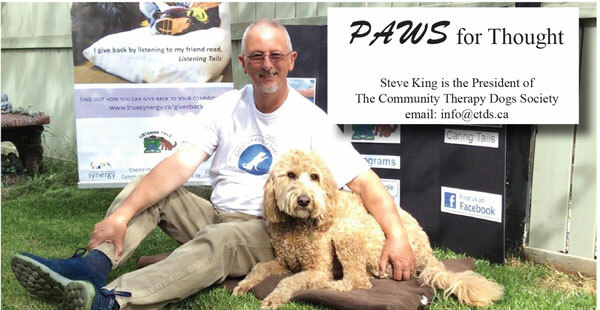 •Helping young kids improve their confidence in reading out loud by reading to the dogs. This new found confidence has also helped these kids to participate more in class activities. •Seeing a senior’s face light up when a dog visits. Many seniors have had a dog earlier in their lives and miss the unique interaction that a dog can bring. There have also been many examples of seniors suffering from, say, dementia who “come alive” when around therapy dogs. •Being around students over exam times to help de-stress them. •Helping someone who is grieving or who has experienced some traumatic event that is causing them to shut the world out. Kids in particular feel safe around therapy dogs and have been able to unburden themselves from issues they are carrying around in their minds because the dogs are non-judgemental. Because of the work they are doing in the community, does this give therapy dogs any more access to places that dogs are prohibited from? The answer is simply “NO”. In the eyes of the law, therapy dogs are treated like any other dogs, except service dogs. Access to, say, a restaurant or to the cabin of an aeroplane is completely at the discretion of the owners of the facility/ company. With society now more aware of the benefits therapy dogs can bring to their lives, there is an ever increasing demand for more therapy dogs so, if you have a dog(s) that you feel may work out as a therapy dog, please contact me on 587 581 5571 and we can chat further.